There is nothing that Cédric Grolet likes more than to revisit tradition, with reverence but without submission. An admiration that does not eclipse his ability to bring his personal and creative brushstroke through laborious piping and impossible decorations. 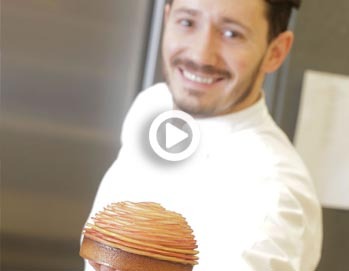 In France he is one of the most clearly growing pastry chefs in recent years. 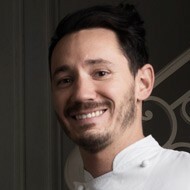 It is not easy to surprise with simple pastry, but his precision in the finishes and the virtuosity of his decorations in classics such as Saint Honoré, the galette de rois, the Paris Brest, the millefeuille , the tartar aux pommes and other seasonal products, has led to half of France become fixated on him. 2005. First prize at the Festival National des Croquembouches. From 2006-2011. Pâtissier at FAUCHON Paris. 2016. The Relais Desserts association grants him the title of “Meilleur Chef Pâtissier”. 2017. Launch of his cookbook Fruits. The further we advance, the closer we will be to simplicity, to the essential.